Episode Spotlight: Mr. and Mrs. Who? Capsule Summary: Charles returns from a drunken weekend in Tokyo to discover he has a wife. Although the Charles A story is amusing, part of me can’t believe Chuck Emerson Winchester III would allow himself to get drunk enough to black out for much of a weekend. He’s been drunk before but he always had a reason. In “The Billfold Syndrome” he drowned his sorrows over losing a position stateside while in “The Young and the Restless” he spent three nights drinking after a hotshot young surgeon makes him question his abilities. As much as Charles enjoys the occasional glass of expensive brandy, he doesn’t typically drink to excess. He’s not the kind to get drunk and go wild. He admits he’s only come close to being as drunk as he was in Tokyo once before in his life, the night he graduated from Harvard. At no point does he question why he partied so hard even though it’s completely out of character. Of course, he proceeds to get very drunk again at the party to dissolve his marriage. Fortunately, the two brilliant doctors come up with a way to save Shaw’s life. The fate of the other two cases of hemorrhagic fever, mentioned by Hawkeye and B.J., is never revealed. Presumably, they survive as well. Charles can’t remember Donna Marie Parker’s name. This isn’t the first episode involving hemorrhagic fever. Frank came down with it in “Soldier of the Month” during Season 4. B.J. (as J.B. Honeydew) is reading from a comic book while unmarrying Charles and Donna. The cover is never shown but it looks to me like there’s some sort of animal on the page shown on screen. Maybe a bear. Among the uncredited extras enjoying the party in the Mess Tent are Jo Ann Thompson, Gwen Farrell, Kellye Nakahara, and Roy Goldman. This morning, when I checked out, the manager sharply advised that I stay away…in perpetuity. The unwedding party at the end was a stitch. 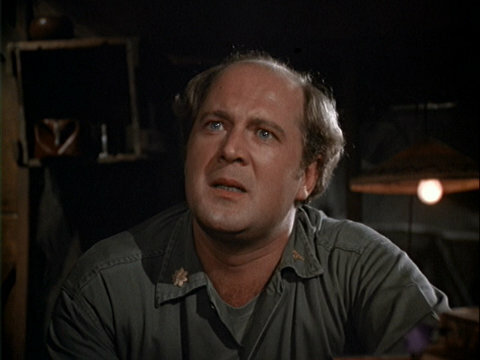 David Ogden Stiers was brilliant in this episode. Other than as an obvious plot point why would the Army be so decided upon a cure to use to go to the length of making it a court marshal offense to disobey the directive? Maybe so they could be sure the doctors were doing it. Sounds morbid but I took it as human experimentation. If all the doctors did it their way, they would know for sure whether it worked. If they didn’t make it a serious offense, doctors might go off trying their own things and there would be too many variables to know if their new “treatment” really had any effect. 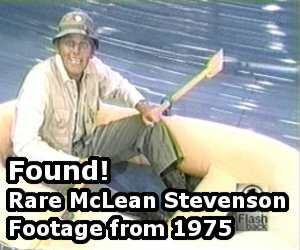 I would have liked to have seen the photos Hawkeye and BJ found. It was also fun getting a peek into Charles’s younger days when apparently he could be a real party animal. Just noticed that Charles, who later claims no knowledge of “Lil’Abner” in this episode references a character named Marryin’ Sam. Unless, of course,that was a common phrase before Al Capp came along.